Is his health too bad? aa thanks Gary Much appreciate it bud! Thank you for being willing to make a difficult decision. I hate this that people keep animals and it is all about "my" feelings but the suffering of the animal is not taken into account. How do I whatsapp you a beer? I agree with you, but sometimes people get shamed for deciding to rehome their pets rather than put them through this. On another thread someone mentioned how the emigration experience traumatised their dog so badly, he was never the same again. They said if they had to make the decision again, for the dog's sake they would have rather rehomed him. Pets' emotional and physical well-being must definitely be a consideration when emigrating. We should trust that owners made the right decision for their pets because they know them best, and support them, because either decision is hard on both owners and pets. @Mrs. Zog Yoda is touching 9 this year so getting on the older side of life. It is sad but we believe better for him in the long run. We will definitely not send him to the SPCA or pug shelters or or or. We will find him a decent home. Ri has already found an older lady that is willing to take him on. This is actually a perfect fit for him. We experienced a heat wave last week, well at least what NZ considers a heat wave Temps in Wellington reached highs of 28-30, some parts of the country did hit 35's, but it was still not SA heat. It was hot and humid but not Durban style. I still have to acclimatize so wasn't that bad for me. So I got some weed killers and sprayed it last weekend. This weekend it started taking effect but new ones popped up. Will need to get a stronger weed killer it seems. I also want to remove all the grass in the one enclosed area and plant softer greener grass. Wellington grass is almost like "steek gras" that I am used to seeing on the farms. Not the nicest to sit or play on for kids. Even with a heat wave, the mornings were cool and misty! Nice man - check all those perlemoen shells - yum! A driver who crashed into a motorcyclist in "a moment's inattention" has met with the man to apologise in person. 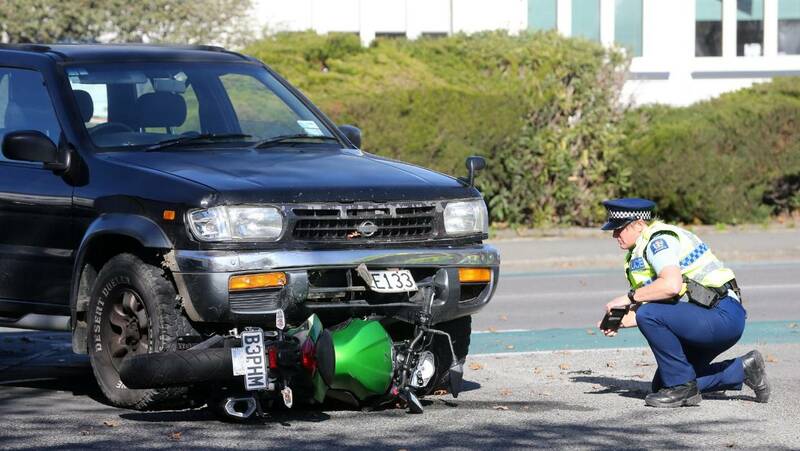 Valerie Mavis Gray, 63, was driving her Nissan Terrano at the intersection of George St and Seymour St, in central Blenheim, about 2.40pm on September 20. Gray believed the road was clear and pulled out into the intersection, knocking down the motorcyclist and dragging his bike across the road, wedged under her front bumper. Gray was still in the car when emergency services arrived, a police summary of facts said. An ambulance took the motorcyclist to Wairau Hospital, in Blenheim, where he was treated for a broken femur and a broken bone in his hand. Gray admitted a charge of careless driving causing injury last November, and reappeared for sentencing at the Blenheim District Court on Monday. Her lawyer Laurie Murdoch said the case had been remanded off so Gray could complete a defensive driving course before sentencing. "She had an elderly neighbour with her and they were both very shaken by the crash," Murdoch said. Gray was "devastated" to be in the courts, as it was her first criminal charge during her 63 years, Murdoch said. She had met with the motorcyclist through the restorative justice process to apologise in person, and paid the motorcyclist $1000 in reparation. The motorcyclist said in a victim impact statement he had rods and screws put into his leg, and had been unable to work, and was missing out on wages. But Judge Denys Barry, reading the victim impact statement, said the motorcyclist had accepted Gray's apology, and her offer of reparation for the loss of his bike. "There was a moment's inattention, that resulted in harm," Judge Barry said. "As it often happens in cases such as this, the harm is out of proportion to the lapse of attention, and the consequences went way beyond the norm." Judge Denys Barry convicted Gray and gave her the minimum mandatory disqualification period of six months. minimum mandatory disqualification period of six months. I'm more interested in the "restorative justice process". In ZA, the biker gets buried and the driver keeps on driving. It's just astonishing the difference between NZ and SA (1st vs. 3rd world). I mean, everything about this whole story is different. Admission of guilt, repentance, mandatory defensive courses, reparation in a personal capacity (even though it's forced), disqualification (from driving?). It's refreshing. That how things should be. Family tickets booked and paid for - 5weeks and counting...cant wait to see them. We had a public holiday on Wednesday - Waitangi Day - the anniversary of the signing of the Treaty of Waitangi, celebrated as a public holiday in New Zealand on 6 February since 1960. Its been a rough week for the south island. A fire that sparked on Tuesday is still out of control and of this morning are covering 2,000 hectares. They are now evacuating another village of 3,000 people. Currently, it is unknown how it started but firefighters have been at it for 4 days and the fire is still out of control. 1 house so far destroyed and estimated $2mil damage to date. Really hope they get it under control soon. However this did not bring peace as there were various conflicts between the British and Maoris from 1845 to 1875 and is known as the New Zealand wars. The biggest problem as in most countries where the British ( ) landed was over land and smaller groups refusing to acknowledge the crown. Eventually, in 1860-1875 the british and NZ armed forces got involved. In the end, Waitangi Day means everything – it's whānau, community and helping others. It's wāka, kapa haka, tupuna, karakia and kai. I just spent 2 weeks in Aussie and a week in NZ. It seems they have the exact same history as SA. The white man came and stole their land. Now the respective governments pay them to live in their own areas. Not much different to SA except that they represent a tiny fraction of the population. celebrated as the day Australia was founded by Captain Cook, as they were there before him. I guess it happens in every place that was colonized. Civil defenCe authorities decided to evacuate parts of Wakefield on the South Island. Authorities opened up a sports stadium as a welfare centrE and said they could accommodate people who didn't have friends or family to stay with elsewhere. Others in the town of 3 000 were waiting to hear if they would also be evacuated, and many were choosing to leave. Police and civil defence responders were knocking on the doors of about 250 affected homes to makes sure nobody remained behind. The wildfire began on Tuesday and had spread to about 2 000 hectares by Friday. It had burned down one house. Authorities believe it was started by sparks from farm equipment. Other, smaller fires were also flaring up in the dry region, including in the city of Nelson, which is home to about 50 000 people. Richard Kirby, the group recovery manager for Civil Defence, said it might be four of five days before the fire is contained. "The general feeling is one of consternation. There's no rain on horizon and it's very dry," he said. "The realism is coming through that perhaps the worst can happen: that the rivers go dry and we can't irrigate, and have severe restrictions on urban water use." Busy but relaxing weekend - I am starting to get "cabin fever" without the family. So I took out my camera this weekend and charged it. This coming weekend I am heading out a bit to go take proper photos. Just not to far as $'s are tight and I try and save where I can. One thing I missed being close to the ocean in east London was seagulls. They relax me and their noises are always welcoming. In Wellington, they are everywhere! and very tame as people don't scare them off. Often you will be walking with 2 or 3 just sitting close by not batting an eye. Some, however, are just downright cocky and won't move when they in your way. I also picked up some fubar chair and height adjustable table on Sunday from an old lady living in a retirement village bought it for $1 and perfect for the garage. Both are on wheels so can wheel it around the garage as need be. Also, my package arrived from the states with a Mr Zog touch to it Thanks @Mr Zog ! Now I just need to find a spot for them! As for the "racist" restaurant... when I was working as a bar tender, I came with all sorts of things to remember customers. "Guy with weird shoes." "Lady with ugly shirt". "Cool hairdo". "Pale lady with freckles". Even in Botswana, we would meet 10-20 people at a time. Ain't no way I could remember every person. As they were normally different nationalities, that is how I remembered them "Loud Americans". "Asian group". "Vodka". People are just too sensitive and quick to jump on the racist train as an easy way out. @Sardine and its only getting worse. People of today wont survice the 80'90's but I do believe its needed. Really show people that they focusing on the wrong stuff. Now, on that subject Americans are very much disliked in NZ. Wellington often has these huge cruise ships stop in the harbour (2-3 a week in peak season). We had 2 this past week and all my colleagues that come back from lunch immediately stated, "F* americans", with one even going on a bit of a rant, the fat F*'s that they are, eating non stop and screaming at each other in the streets forcing the locals to squeeze past their obese stomachs. 4weeks! 4weeks as of today till the family flies! Shamelessly stolen from google but this is what it looks like currently. And the time is flying, just like I told you it would. only 4 weeks left!